The breakroom is where everyone loves to meet, collaborate, and recharge. And you’re in charge of keeping that breakroom stocked with the snacks and drinks everyone loves. 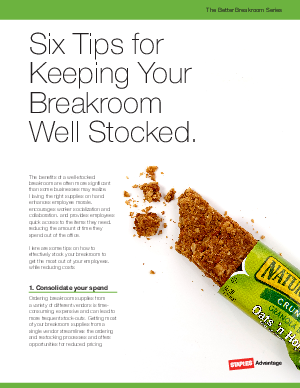 Get six practical tips to streamline your stocking, cut costs, and put more smiles on co-workers’ faces. It’s all here.